If you want to enjoy a healthy snack which doesn’t break Paleo diet rules, you’ll love our Paleo-friendly Cauliflower Popcorn recipe. This delicious recipe mimics the taste of real popcorn and it’s a great snack to nosh on while watching TV or hanging out with friends and family. In addition, it’s really affordable, unlike some paleo snack recipes, so it won’t bust your budget. Healthy diet recipes like this one will make it so much simpler to stick with the Paleo diet and easy diet recipes like this one will take only moments to prepare! First, you’ll need to buy one head of cauliflower. If you prefer to, you may purchase this vegetable in a pre-cut version – however, the amount that you buy should be roughly equal to a single head of cauliflower. You will also need to buy some parchment paper. The only other ingredients that you’ll need are olive oil (four tablespoons should do it!) and salt. Unlike some Paleo diets recipes, this one does not require a range of ingredients. To make the recipe, pre-heat your oven to 425 and then clean the cauliflower. You’ll need to get rid of its core, trim it at the head and then it into cut smaller pieces. Your pieces should be the size of golf balls. Once you’ve done this, add olive oil and salt to your recipe and then coat the cauliflower pieces. Lastly, cover a baking sheet with the parchment paper – this will make cleaning up really easy! 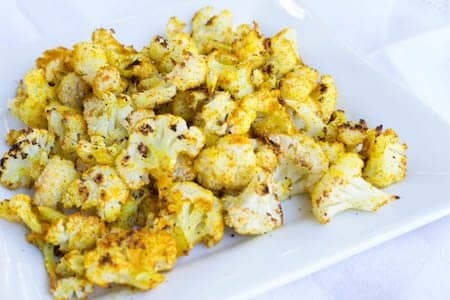 Place the cauliflower pieces on your baking sheet and then roast them for sixty minutes. During baking time, turn the pieces a few times in order to ensure that they become golden-brown on all sides. Once baking time is complete, you’ll be ready to enjoy this delicious recipe! This recipe is great and you’ll likely turn to it often in order to satisfy cravings. However, there are plenty of other Paleo-friendly recipes out there, many of which are available right here at our website. We therefore encourage you to find recipes which will work for snacks, breakfast, lunch and supper. Once you’ve found some stellar recipes, you’ll be ready to create a Paleo diet plan that is sensible, nutritious and tasty. This type of diet offers plenty of benefits and knowing the right recipes will definitely make it easier to stay on track.